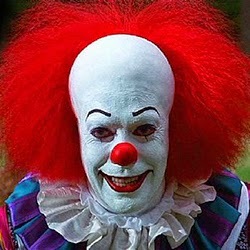 "Scary Clown" is the title of the jpg file associated with the image shown above. I guess you could say that this is another blog posting more or less inspired by a picture. I think the picture is creepy. I think that GMOs are creepy, too. That acronym means "Genetically Modified Organism," and the GMO abbreviation can be thought of as a shorthand way to designate the latest human effort to remake the Natural World. If you haven't been following the controversy, I hope you will start doing that. You could sign up for bulletins from the Organic Consumers Association (which is where I found the clown picture), or you could research materials from the website of the Council for Responsible Genetics. Anybody who reads this blog in any consistent way knows that I am not in favor of human efforts to remake the Natural World. I think we should be focusing our attention on the world for which we do bear direct responsibility, that "human world" that we create, and that we most immediately inhabit. The image above is associated with an article describing the "Safe and Accurate Food Labeling Act of 2014." This is a bill that would prevent state or local governments from requiring accurate food labeling, letting consumers know when products they buy contain GMOs. The proposed legislation, in other words, would do exactly the opposite of what the title suggests. Be warned about this legislation. And about GMOs. Transgenic technology isn't scary once you understand that it's no more risky than traditional breeding which has been going on for thousands of years. Your dislike of things "unnatural" is the sad and pathetic consequence of a fallacy called the "appeal to nature" having clouded your thinking. I ask you to stop spreading these diseased thoughts on your blog and on Facebook. Your making the world a worse place. Stop it. Instead of vaguely and worthlessly warning people about GMOs, why don't you go read up on the science? Food labeling is about people's right to know information relevant to their health. The fact that a plant was genetically modified tells you precisely *nothing* about its relevance to your health. By the way, the Organic Consumers Association post with the clown picture claims (lies) "... those toxic chemicals are making us sick" and links to another post about the Seralini study, which is their instant disqualification from a credible argument. GMO denial is the same beast as Global Warming denial.